It was 1998, and already a few years into becoming a fully-fledged wine writer I still lapped-up anything new, anything unexpected, anything that might offer a genuine wine experience. The wine column in the Sunday Times newspaper recommended a wine feom the Safeway supermarket, priced at £3.99, that the writer predicted should age and improve for a decade or more. And what was this bargain basement Vin de Garde? Not a Claret (already far too expensive by then) and not, surprisingly enough, even a red wine. 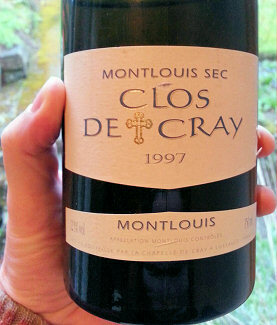 The wine was a dry Chenin Blanc, from the Montlouis region of the central Loire Valley. Intrigued, I bought a couple of them and tucked them away in my cellar, where they have lay, undisturbed, for 17 years. I have occasionally come across the bottles as I looked for something to drink from the cellar, but by-passed them in favour of grander whites from Chablis or Alsace, fearing I may have left it too late for these cheap wines. In May 2015, however, the stars aligned and one bottle was retrieved. Through the glass the colour looked deep but good (no browning) and so after half an hour in the fridge I popped the cork. And what do you know? The wine was absolutely marvellous, still full of life and perfectly balanced. The epitome of mature Loire Chenin at its best. Pouring a brilliant buttercup yellow, the nose soars from the glass, a mysterious and wonderful melange of old waxy parcel string, fresh butter, lanolin and the zest of lemons. There are honey and flower nuances too, in a deep, intriguing layering of scents, some Botrytis notes perhaps. On the palate it has a fairly rich texture, and that butteriness is there, an old wine obviously with notes of honeyed oxidation, but sweet, ripe apple fruit, before a thrusting, sharpened-steel core of acidity slices through, all fresh citrus and salts, into a long, balanced finish. 93/100. What can I say? I have one remaining bottle that surely must be shared with a wine-loving friend or two at some point in the future? A bottle has been languishing in a cupboard for 20 years . Am no wine expert but am fearful that it has not been stored properly. Don’t think I can chance it on friends ? but am curious as to condition if I finally pluck up courage to open. Sandy, there’s one way to find out! 🙂 My bottle had been stored well (cool, lying down, in the dark) and was in great condition for its age, but those conditions are so important and if it looks abnormally dark/brown in colour through the glass you might find it has suffered. I’d open it, but have something else on standby just in case – and please do report back.